From the palest of Pinks & Blushes to the most vibrant of the Reds - pulling together some inspiration for you for the upcoming Valentine Holiday!!!!! I don't have anything planned, got the Hubs a cheeky little gift, being under the weather still makes for a low-key holiday. And I don't mind one bit!!! Do you have anything planned with your Hunny or girlfriends? *Thank You all SO much for all the well wishes these past few days! It means so much!!!! I'm still a bit under the weather, and will be taking my rear to the doctors if by lunch I'm not feeling better! **PS - Don't forget the LOOKMATIC discount is still going for the rest of the month - have you gotten yourself a a pair yet???? PS2: I have the YSL book too!! I'm going to be sporting all of red on the blog this week. I've got red legs today, and I've a red and pink look planned for tomorrow! Love the stuff you put together. So sad you aren't feeling better!! Recovery will be soon!! I do love all of these Valentine's treats, I'd take any of them! So fun! I love the necklace so much! I want those red pants! What PERFECT Valentine's inspiration! 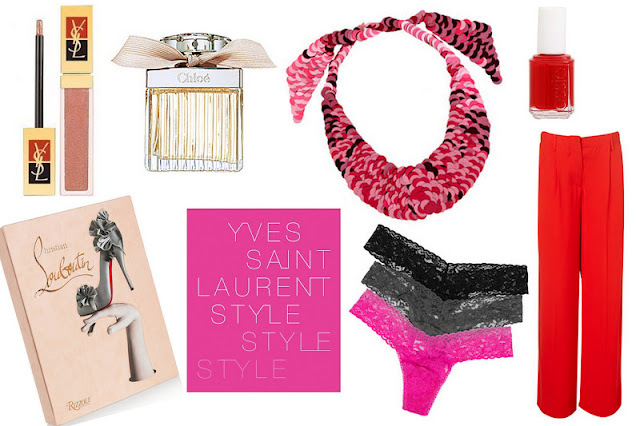 I love those pants and the YSL book is definitely on my wishlist. We are staying in and making fondue together, drinking wine, and watching a corny movie! It is our first V-day in years where we are actually staying in and I'm kind of excited! Love your round-up. I'll definitely be color-blocking red and pink tomorrow!